Here a few usage and performance tips while working with Plexus. Facets are created by the geometry objects or imported from the OBJ files i.e. they are created only when the geometry is initially created or imported. You can apply noise to the vertices and the Facets are not recalculated. Also, you can apply noise to the facets itself, i.e. vertices remain at the same place but the facet properties like position and color can be altered without changing any vertices. The Facets have to be rendered using a Facets Render Object. Triangulation Object triangulates all the vertices every frame. No matter how much noise is applied to the vertices, just before rendering all the vertices are triangulated. Its almost like mesh reconstruction. Facets Render Object just renders existing facets while Triangulation Object actively recalculates the triangulation for every frame. So there is no way to add noise/effectors to those triangles created by triangulation object. They are only created just before rendering in the final stage. For After Effects CC 2015 or Later: Starting Plexus 3, if you’re using Null Objects in Layers Object there is no performance penalty. In fact, it is recommended to use Nulls over point lights because of their flexibility. You can continue using Point Lights, but they’re no longer recommended. For Older AE versions of After Effects (CC 2014 and Before): Older versions of AE don’t have the necessary APIs introduced in CC 2015 so, point lights are preferred to Null Objects when working with Plexus Layers Object. OBJ resolution is the most expensive calculation in this object. It is provided for convenience and it is recommended that you simplify the OBJ files before loading into Plexus. If you don’t need facets, turn off the Import Facets option. It gives you better performance, as it uses a different resolution and transformation algorithm. It is not recommend to load OBJ files from a network drive. Always try loading them from a local disk drive. If the project is saved atleast once before loading OBJ files, relative paths are stored hence the OBJ files can be moved from one location to another, as long as they are relative to the project file. You need a capable Graphics card that supports atleast OpenGL 3.2. OpenGL rendering is required when using Unified Rendering. Unified Rendering is required to add Depth of Field or Motion Blur effects in Plexus. Only Mac OS X 10.8 or higher support OpenGL 3.2. On Windows, it depends on your Graphics card vendor. Also, make sure to update your graphics drivers. Plexus does warn if the Sprites are exorbitantly huge and take up so much memory, but there is no hard limit it depends on the render load. Generally, anything below 256px is recommended for good performance. If you try turning on ‘Unified Rendering’ and After Effects freezes/crashes, then most likely you’re running outdated OpenGL/Video drivers. To fix this issue, download the latest drivers directly from your vendor’s website (ATI/Nvidia). For Nvidia cards, download directly from http://www.geforce.com/drivers. For ATI cards, download directly from http://support.amd.com/en-us/download. Plexus 3 automatically upgrades projects created in Plexus 2 when you open them. But there are some caveats you need to be aware of. First off, always make sure you’re running the latest version of Plexus 3. You can download the latest version from here https://www.rowbyte.com/plexus#download. 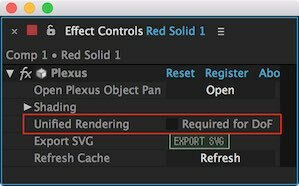 OBJs in Plexus 3 are imported as AE Footage objects. So when you load a Plexus 2 project, Plexus 3 tries to load the appropriate OBJ file automatically as OBJ Footage Files in AE. For some reason, if the OBJ file cannot be imported into After Effects you’ll see the following error. 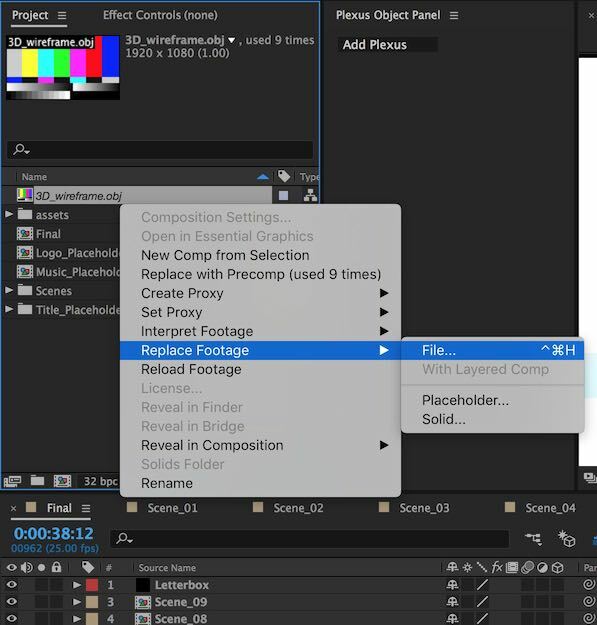 If the OBJ file isn’t found or failed to be imported Plexus 3 creates a ‘Placeholder’ Footage Item in After Effects. You just need to replace the ‘Placeholder’ Footage with the appropriate OBJ file and everything should render as expected. Remove the “Plexus Toolkit” effect from the Effect controls Window. Apply “Plexus” effect to the layer. Make sure the newly applied Plexus Layer is at the bottom of the Effect Stack (atleast bottom of all the Plexus objects). These steps are required because the main Plexus Effect object is different in Plexus v1 and v3. The v1 Plexus effect is automatically converted into Plexus Legacy Render Object.